The chapel was built in 2002 to reflect a Gothic English chapel and was funded through individual and group donations. The design is that of Ken Spriggs. Like all Gothic English chapels, our chapel has an east-west orientation with the front door facing west and the centerpiece window facing east. The sanctuary has fourteen pews that came from Jones County, Pennsylvania and were crafted in the late nineteenth century. The railings, lectern and choir stalls are also vintage pieces found in antique shops in Tennessee and Georgia and were donated to the Museum. 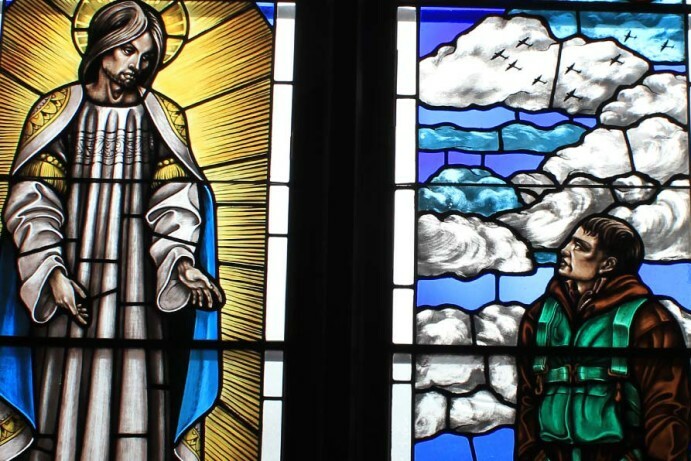 The most impressive features of the Chapel are the stained glass windows. All the windows have been provided by Eighth Air Force veteran groups or family members. Jon Erickson is the artist and creator of the windows from the concepts presented to him by these groups. Aurora Glass studios of Savannah created all the windows. The Chapel is available for weddings, memorial services and church services by special request. Audience attention might be drawn to a few of the windows as described below. Experience a 360 view of the Chapel. 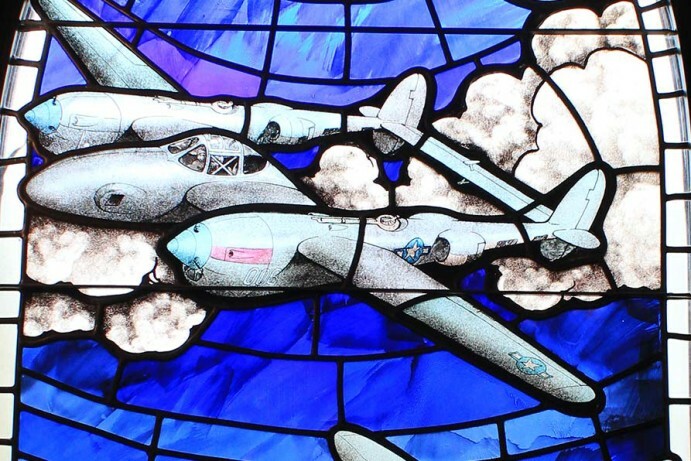 This window is from the 96th Bomb Group duplicating their original chapel window placed in the local chapel near their airbase in Snetterton-Heath. The 96th flew 321 missions in B-17F and B-17G bombers. During the first five months of 1944 they sustained the highest loss rate of all Eighth Air Force groups and overall suffered the second highest MIA losses over the course of the conflict. The 355th Fighter Group was stationed in Bodney, England from July 1943 through February 1945. They flew the P-47D Thunderbolt and P-51B Mustang. The group claims 519 enemy kills in the air and 287 on the ground. 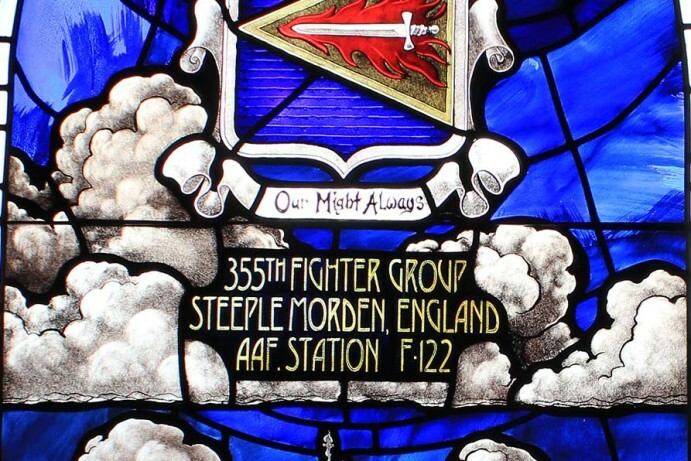 The central focus of the window is the emblem of the 355th and above flies the P-47 and P-51 airplanes. The Eighth Air Force wings rest at the apex of the window and below are three logos for the fighter squadrons. The 355th Fighter Group is one of the few WWII groups that still exist today and fly the A-10 War Hog airplane with their headquarters in Tucson, Arizona. 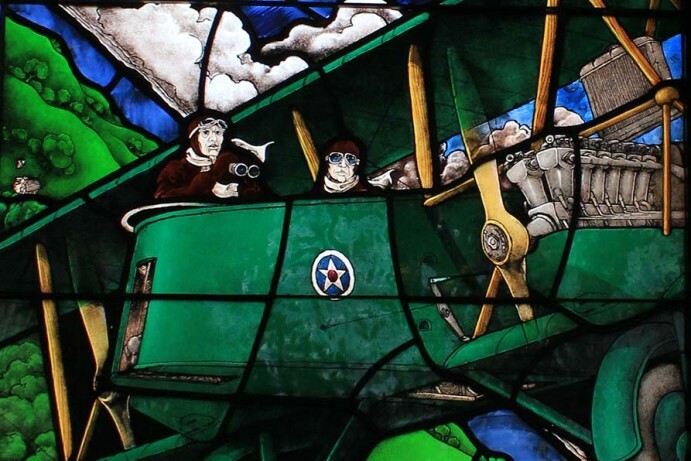 William Sidney Wilson was a pioneer aviator in WWI and was the uncle of window donor John Herrin. He flew the Martin Bomber depicted banking in flight above a country church against a bright blue sky. The 7th Photo Recon Group was the only long range, high altitude strategic Photo group assigned to the Eighth Air Force during WWII. The group was in combat from March 1943 to VE Day taking over 3 million intelligence photos while flying 5693 missions*. Twenty-three pilots were taken as POW’s, seven were Escape and Evadees, and 62 paid the supreme sacrifice. The photo recon P-38 and spitfire fly above reproductions of the Group’s squadron patch emblems. In the film scroll at the bottom of the window is inscribed "In Honor of all 7PRg Who Served."